With consumers rapidly getting savvy about food quality and food safety, the demand for organic beef has never been higher. So why aren’t more ranchers converting to the higher price-per-pound premium organic product? Natural, organic or grass-fed beef varieties—all of which are antibiotic-free—fetch more money, retailing for 30% to 80% more per pound than conventional meat. Organic and natural ranchers typically face greater transparency costs. These include paperwork and audits to demonstrate adherence to animal-welfare, sustainability and other standards required by beef buyers or federal labeling rules. The demand for more transparency in our food system’s ‘chain-of-evidence’ is one more trend contributing to higher grocery prices. Health and sustainability focused consumers love knowing the back story about the food they eat. They also are the first to pass along good information to friends and family. There’s also that pesky side effect from global weirding we’re calling a drought. When you factor in the increased demand for antibiotic free meat by some of the large fast food and grocery chains, we can begin to see a trend in demand outstripping supply. That won’t last forever. Healthy animals cost less to raise. 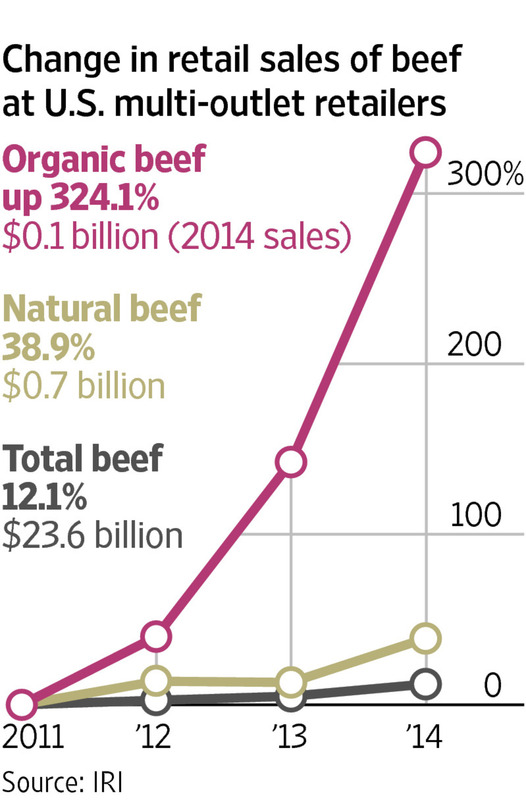 Organic and natural beef is a major food trend that’s finally starting to see significant traction. The decades long educational trickle down from natural products stores has reached the mainstream consumer audience. Now we have to cut through all the clutter and green washing in order to feel confident about the food purchases we make each day. Informed consumers will be the major factor influencing market supply and demand. Expect to pay what it costs to deliver a premium product. Expect to pay more for the non-premium product too.